Is your city in need of a new pavilion? Our team manufactures wood pavilions for cities and parks across the United States. To get started with your pavilion order, call (801) 414-1724 today. Each wooden pavilion is available with two roof options: shingles or mega rib roof. Both options are available in a large variety of colors. Gable Roof Style is our main design for the wood pavilions. Clerestory and Hip Roof are our other style options that are perfect for parks. Open layout, high beams, and sleek columns are just a few of the ways we incorporate a modern design into the custom wood pavilion. At Smith Steelworks, we work with your city’s climate needs. This ensures that the structure will hold up against harsh winds, snow, etc. Why buy from a third-party representative group when you can work directly with the manufacturer? We guarantee the best prices, highest quality, and fastest service on all pavilions. 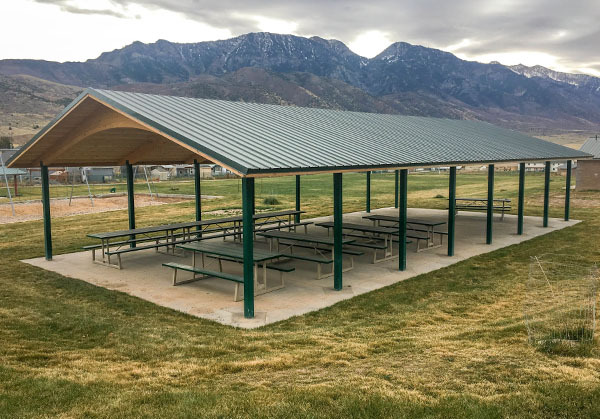 Call today at (801) 414-1724 to get started on your pavilion. Save money on your pavilion. As a manufacturer, we guarantee the best price without worrying about markups to pay the ‘middle man’. Quality, durable products are what we stand behind. We have spent years in the industry researching powder coating, steel, and wood types. This knowledge transforms into a strong pavilion that will last for years and years. 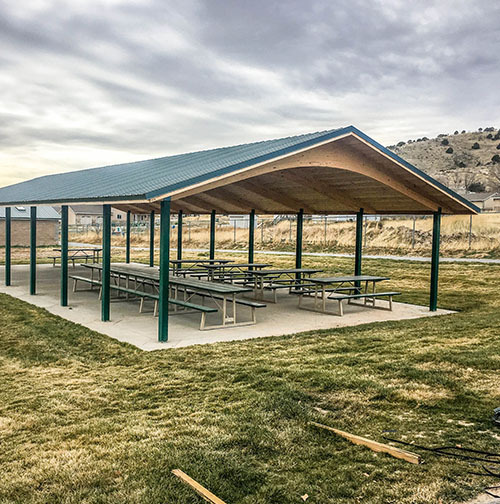 No city park is complete without one of Smith Steelwork’s custom pavilions. Pavilions provide a place for gathering, celebrations, and other public parties. 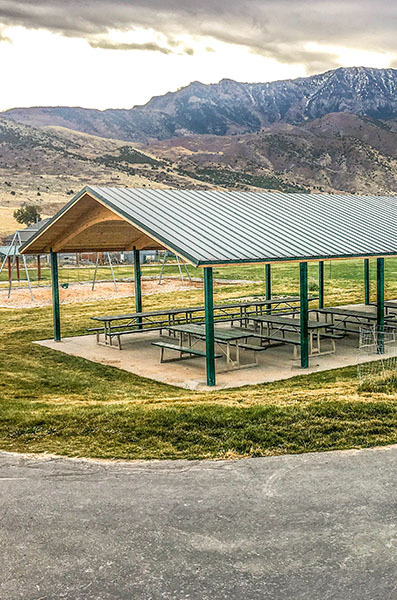 Besides practical use, the shelter’s sleek design adds beauty to every location.